Thank you for visiting our website and your interest in Rams Hockey! 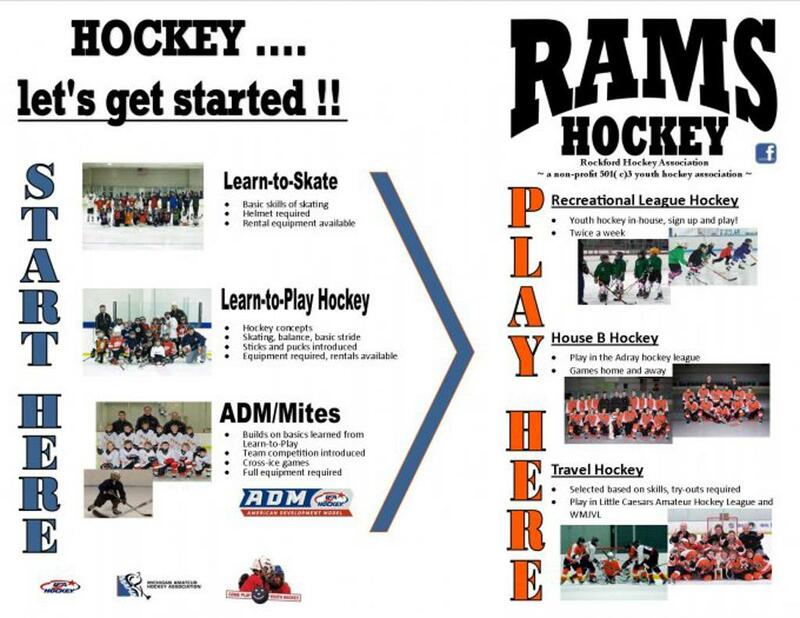 Rams Hockey is proud to offer developmental and competitive youth programs at most every level. Regardless of where you are in your hockey career, Rams Hockey will be a great partner to help give you the skill sets to reach your goals. Instructional Programs: Here you will find information on our Learn-to-Skate program, Learn-to-Play Hockey program, and our newest Cross-Ice (6 and under) program. Recreational Program: Information on our low-cost, low-commitment recreational program where the focus is on fun and skill development! Ages 9-14. House Hockey Teams: Our house B teams are listed here. House B teams compete in the Adray League and no tryout is required. Rams Hockey has house teams for the Mite, Squirt, Peewee, and Bantam levels. Tier II Travel Teams: Our Travel teams are listed here and tryouts are required. Our PeeWee and Bantam travel teams complete in the Little Caeser's Amateur Hockey League (LCAHL). Our Midget (JV) competes in the West Michigan Junior Varsity League. By creating a Sport Ngin account you will receive emails from our organization as well as be able to register for Rams Hockey programs.